It’s late November as I write this. Opportunities for photographing gardens are almost nil (although I did happen on a fabulous fall garden a couple of weeks ago when a new client contacted me). With the soaking rains here last week, all the leaves are down (except for those blasted oak leaves, which will last until January) so finding something to shoot is a challenge. 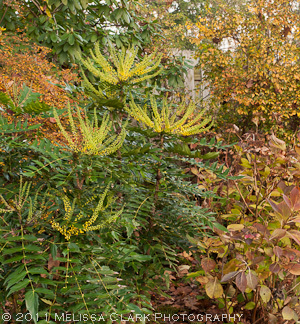 'Winter Sun' mahonia lighting up the landscape in late November in a client's garden. The client had mentioned that he had “a few” of these mahonia around the upper part of his garden, whose hardscape areas were designed several years ago by Corinna Posner (her own garden backs up to this one). But I was totally unprepared for the impact the bright yellow blooms of ‘Winter Sun’ had on the surrounding areas. The blooms of two plants of 'Winter Sun' lead your eye up into the far parts of the garden - and don't you just love the contrast with the pumpkins? 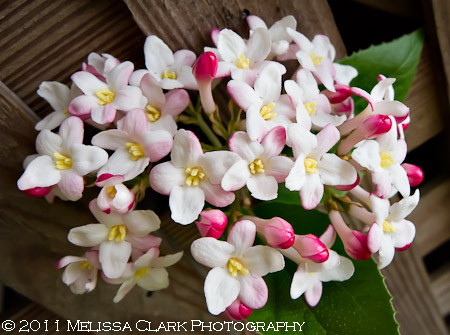 Up close, the blooms are even more striking, and faintly fragrant as well. 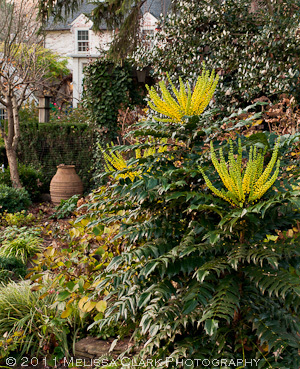 The spiky blooms on 'Winter Sun' turn from chartreuse-green to a bright yellow. After seeing this beauty in my client’s garden, I looked it up online. 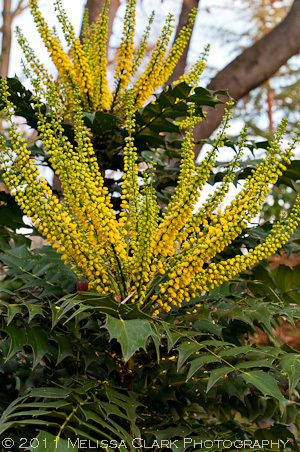 ‘Winter Sun’ mahonia is hardy only from zones 7 to 9, prefers a partially shady site sheltered from wind, and will grow to about 10 feet tall unless pruned to a lower height. It’s more fragrant than most mahonias – and should be deer-resistant although if I’m lucky enough to find one for my own garden I will be putting it to the test. For more details on this stunner, visit Great Plant Picks’ website here. And be prepared for a serious case of plant lust. My vacation last month was a big splurge – a trip to Paris and Oxford, in belated celebration of a significant birthday. I treated myself to a week in the City of Lights with my two sons, then took the Eurostar to London (senior discount: half price! I guess there are some advantages to getting older) where a friend who lives in Oxford whisked me away to stay with her for a week. August may not be the best time of year to visit Paris, but I had no complaints. And although I didn’t go to photograph gardens, my new Nikon 24-120mm f/4 lens proved to be a reliable walk-around friend and I brought back a boatload of photos. 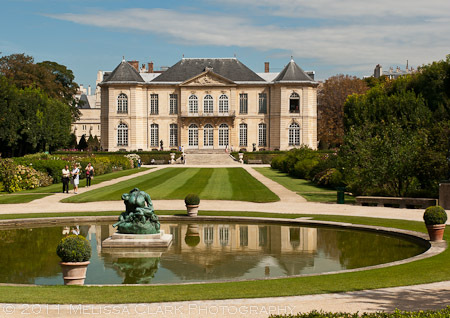 Today, some scenes from the garden of the Hotel Biron, home to the Rodin Museum. 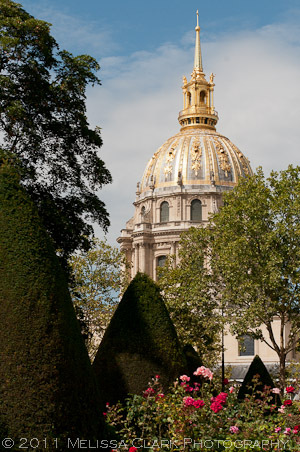 From the garden in front of the Rodin, you can enjoy not only roses and tightly pruned yews but also a stunning view of the Invalides. As it exists today, this garden looks nothing like it did originally. (Rodin’s secretary – the poet Rainer Maria Rilke, who discovered the site – described it as having “an abandoned garden, where rabbits can be seen . . . jumping through the trellises like in an old tapestry.” Add that to the fact that other artists such as Jean Cocteau, Isadora Duncan, and Henri Matisse were already occupying the premises, and one can understand the allure of moving in.) 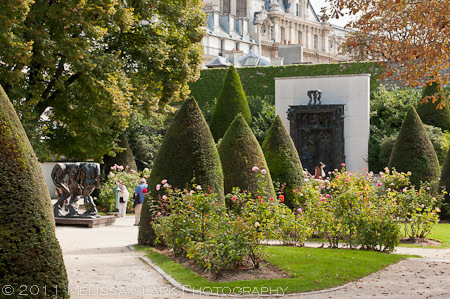 The rose garden in front of Rodin’s masterpiece, The Gates of Hell, was initially planted in the 1920’s, shortly after the building became the museum of Rodin’s works that it is today. A garden dedicated primarily to sculpture has to have its planting scheme and components chosen carefully. 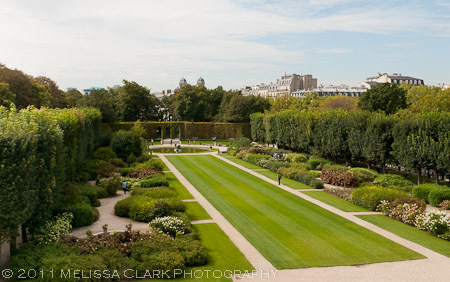 Most of the Hotel Biron’s grounds – as is true of many other public garden spaces I saw in Paris – are dominated by lawn areas and large yews carefully sculpted into conical shapes. The roses soften an otherwise very formal feel to the garden. 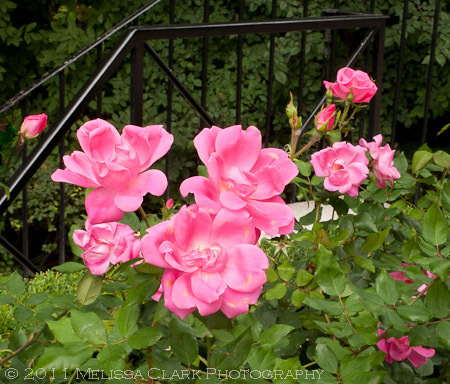 I was impressed with how many roses in bloom I saw in the garden, despite the lateness of the summer. There was even one named “Rodin,” created by the famous hybridizing firm Meilland. It originates from the Knock-Out rose; seven hundred of the Rodin roses were planted on the southern terrace of the Hotel. The color has been described as a “Tyrian purple,” but I thought it more pink in hue. 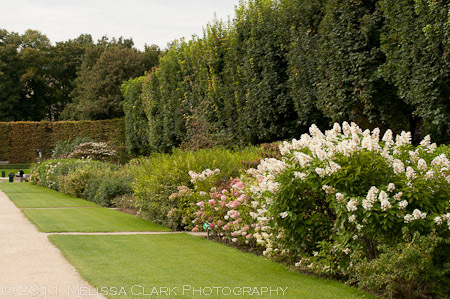 Hydrangea paniculata shrubs were at peak bloom in the parterres. Panicle hydrangeas and other shrubs edge the parterres. At the end of the rear garden is a large pond with Rodin’s sculpture Ugolino devouring his children (a cheery thought). A groundskeeper at the museum prunes roses in one of the beds on a hot August day. Note the horse chestnut tree in the foreground, with leaves affected by a bacterium that has spread to many of these trees in France and Europe in general. 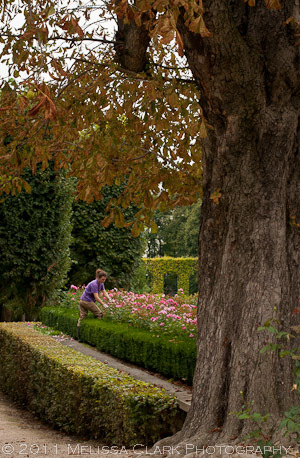 For more information on the garden of the Hotel Biron, click here. If you are in Paris and interested in visiting, the Museum is located in the 7th arrondissement, near the Invalides, on the rue de Varenne. This post marks the 100th “episode” of Garden Shoots! I’m grateful to everyone who has visited, whether regularly or only once. 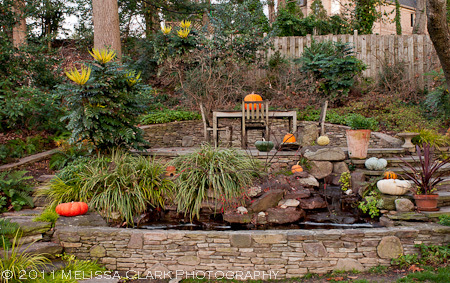 Thanks to the demands of my fall design and planting schedule in the “real world,” Garden Shoot posts will appear on a every-other-week basis for the remainder of this year. Early in my design career, I worked with a client on a master plan for a house she had moved into recently, in the District of Columbia. The back yard was designed to have two different seating areas (actually, three, if you counted the small porch overlook into the landscape). For the one nearest the house, we installed a small flagstone patio on stonedust adjacent to the deck and to a basement entrance to the house. We wanted to camouflage the entrance, which was a simple concrete opening; I chose skip laurels which over the years have done the trick. But I also wanted to include something more ornamental that would provide fragrance, so I planted a couple of ‘Mohawk’ viburnums. Because we don’t maintain the garden on a regular basis, when we do spring cleanups in the back yard, I go along with a crew myself. And often – as this year – the visit coincides with the Mohawks in bloom. Sheer bliss. Not only are the blooms ornamental and prolific in the right site, they have a heady, clove-like fragrance that is simply intoxicating. 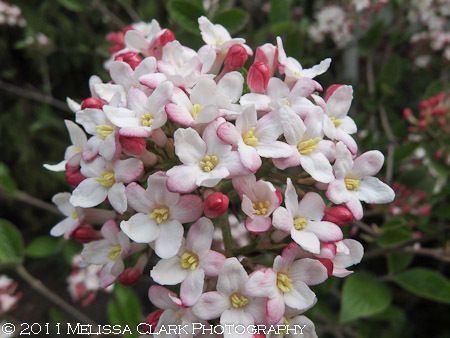 This Mohawk viburnum is covered in blooms. And up close, the flower heads remind me strongly of crabapple blooms – another spring beauty in our region, but without the heavenly scent. Even at the back of the shrub, up against a lattice screen, the blossoms are happy. 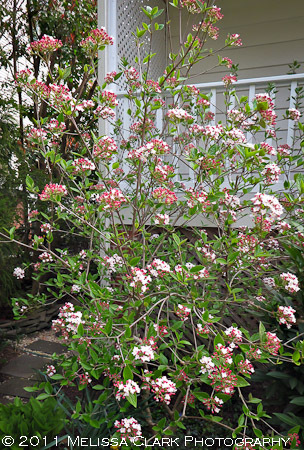 This variety of viburnum, developed by the National Arboretum’s Dr. Don Egolf (after whom a variety of the Chinese redbud was named), is resistant to leaf spot and powdery mildew. An added bonus are its orange-red leaves in fall. No wonder the Pennsylvania Horticultural Society gave it a Gold Medal Plant Award in 1993. It’s listed as being suitable for light shade, so I am considering including it in a plan for a client with a partially shady back yard who loves fragrant plants. What a great way to start the growing year! Yes, I know, spring is just around the corner – but those of us in the mid-Atlantic region of the eastern U.S. aren’t quite there yet. Still, there is some excitement to be had in the garden these days, especially if you are fortunate enough to have somewhere in your landscape a witchhazel (Hamamelis x intermedia). These shrubs usually grow about 12-15′ high and have a wide spread at maturity. Their strap-like, twisted petals are a sight for sore eyes in winter. 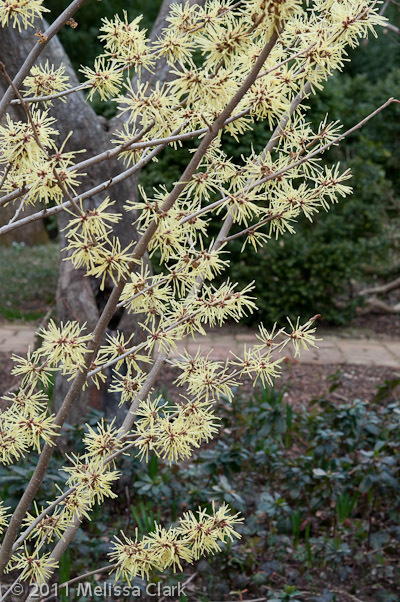 As I wrote when I first began this blog, it was the sight of a ‘Jelena’ witchhazel in bloom at the National Arboretum, many years ago, which helped spark my interest in garden photography. But when it comes to planting them, it’s hard to choose a favorite. All of them provide welcome color at the end of winter, when a gardener’s soul – and eyes – are eager for spring to arrive. The petals, which appear on bare stems, are lightly fragrant. And there’s even a bonus, in the fall, of beautifully colored foliage. Do you like yellows? I saw two specimens at Dumbarton, close by each other (not far from the Orangerie), that were equally lovely. Thanks to a little sleuthing by my work colleague, Abby Yager, I’m able to identify them for you. The first one is Hamamelis x intermedia ‘Arnold Promise,’ with a rich golden yellow color. This is a favorite for landscape designers since it’s quite vigorous and reliable; it was developed at the Arnold Arboretum. This particular specimen, according to Dumbarton Oaks, was grafted onto H. virginiana rootstock. Prefer something a bit paler? 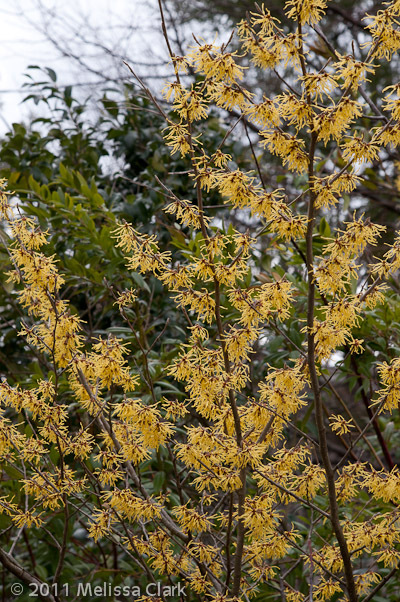 Here’s Hamamelis x intermedia ‘Angelly.’ Its pale yellow flowers really stand out against a dark evergreen background. 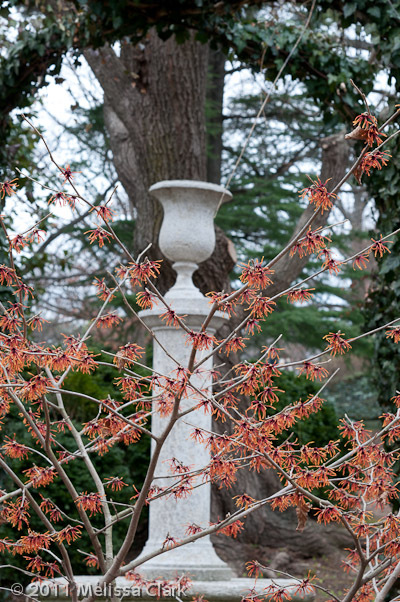 According to what I’ve been able to learn, ‘Angelly’ is a more upright-shaped witchhazel that blooms relatively late in the season. Around here, you see most witchhazels in bloom in late February into early March. There is another species, H. mollis, which blooms in late fall. New cultivars are developed regularly. But sometimes if you dig a little into history, you learn something fascinating and sweet about the old tried-and-true cultivars. According to Wikipedia, Jelena and Robert de Belder of Arboretum Kalmthout, selecting for red cultivars, found three: the first, with bronze flowers, was named ‘Jelena’; the next, with red flowers, was named ‘Diane’ (the name of their daughter); the last, with deep red flowers, was called ‘Livia’ (the name of their granddaughter). Nothing like keeping it in the family. Now I just need to find space for one in my own garden. It’s cold and snowy and a little icy outside my door. First power outage is behind me, and spring seems very far away. I’ve almost finished redecorating the upstairs bedroom (although it still needs some artwork on the walls). But my eye is hungry for a strong jolt of color. Red is a powerful hue, one that draws your eye, wherever you are. 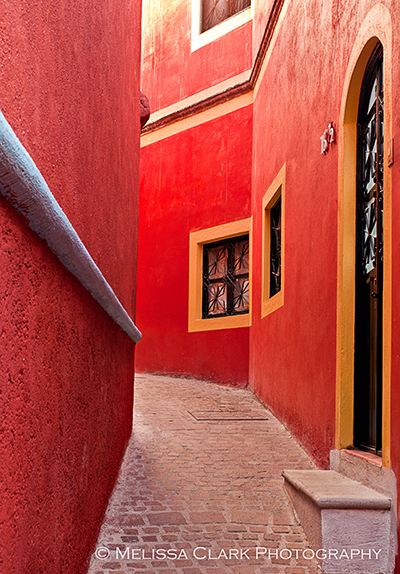 Here’s an image from my Mexico trip, on a street where someone REALLY liked red. 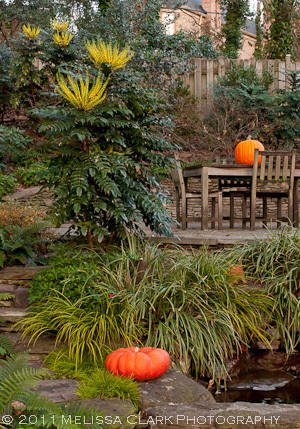 or in pots with other seasonal choices, like the pine branches here. 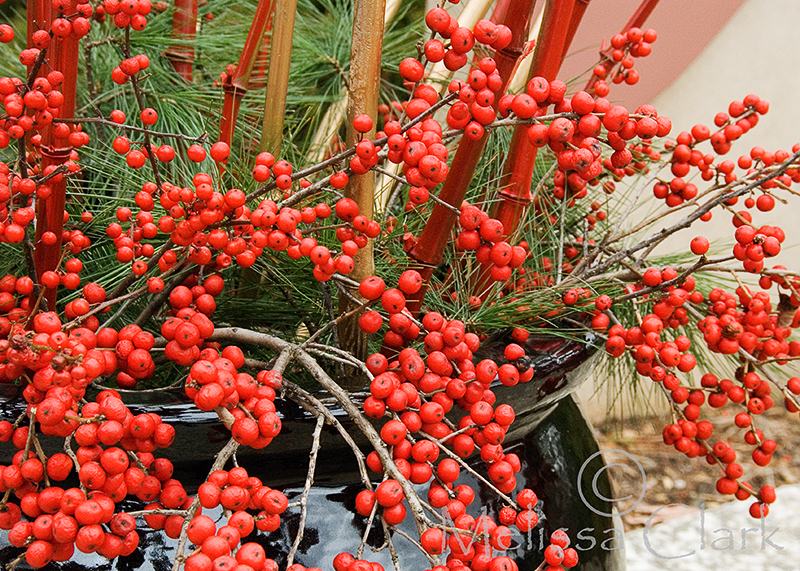 A spray of Ilex verticillata berries in a late-fall container at the National Arboretum. Another favorite pairing for them in the landscape is with ornamental grasses. Winterberry with ornamental grasses at the National Arboretum. 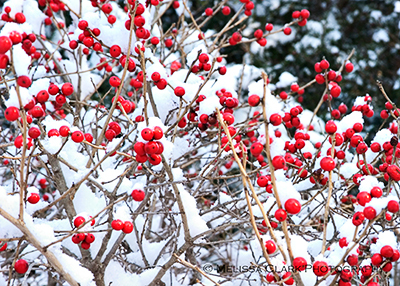 Berries aren’t the only place to find reds in the winter landscape. Cornus alba ‘Ivory Halo’ is one of my go-to plants for winter interest. In the summer, its variegated leaves can light up shady areas of the garden, although it also does well in sun. But come winter, its branches are red, providing a strong focal point and lots of visual interest. The newest shoots have the strongest color, so prune out the oldest canes in the spring periodically. And plant this shrub, if you can, against a background of evergreens for maximum impact. 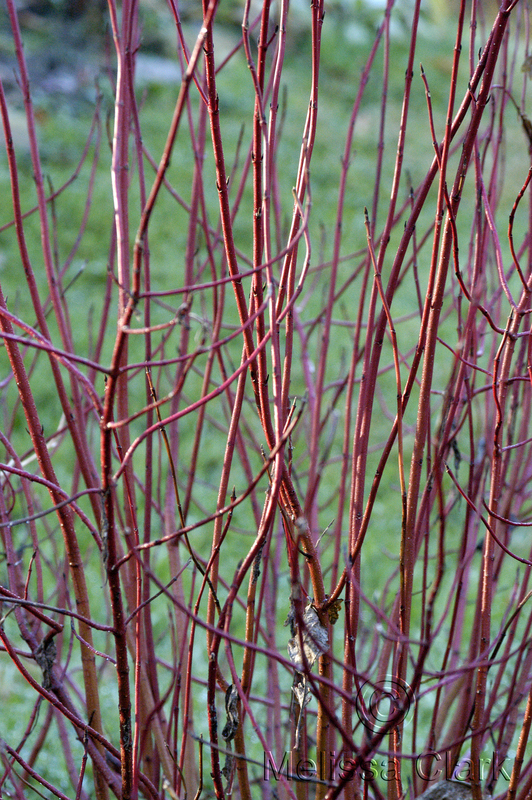 The stems of variegated red twig dogwood show their color only in the winter. Finally, if you’re looking for something larger, try Acer palmatum ‘Sango Kaku,’ often referred to as the “coral bark” Japanese maple. 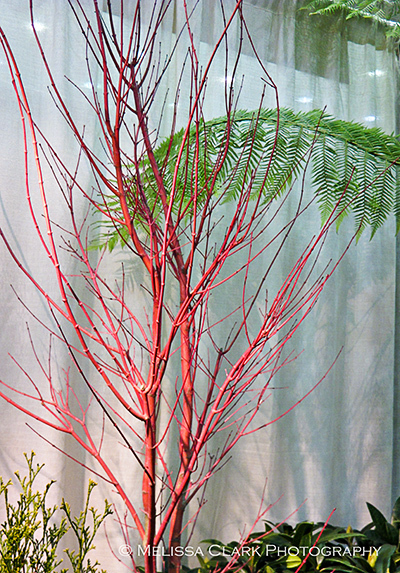 Like ‘Ivory Halo,’ its reddest branches are the newest. In the growing season, its leaves are a peaceful green, turning to a yellow-red in the fall. Somewhat twiggy in habit, it won’t eat the house, which also can make it susceptible to winter breakage from heavy snows. Here is a shot of a young specimen which I saw at a recent trade show. The coral bark Japanese maple offers another alternative for gardeners seeking some strong color in their winter landscape. So for those of you who are looking for some red to perk things up during the winter in your garden, the options are varied. Go for it! Let’s begin 2011 with a look at one of my favorite solutions to a frequent design problem. 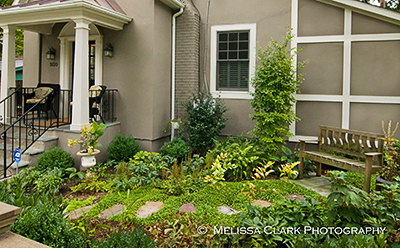 Creating shade gardens where you need evergreen shrubs can be a challenge. One quickly tires of the ubiquitous choices (yews, cherry laurels, nandina), useful though they may be. 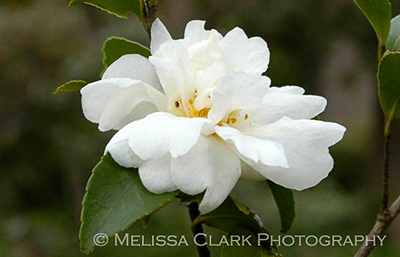 Add a desire for a flowering plant and one idea that comes to mind for me in our area is a fall or winter-flowering camellia. Although it’s not one of the Ackerman hybrid camellias (more about them below), members of the Camellia sasanqua “family” have hardiness traits that make them appealing to try in residential gardens above the Mason Dixon-line. In fact, C. sasanqua ‘Kanjiro,’ was one of the first evergreen plants I put in my own garden after going through my landscape design program. My Kanjiro sasanqua camellia in bloom in 2004. Note the dark green color of the leaves, which on this variety of camellia (as opposed to the better-known Camellia japonica shrubs) are smaller, making them a bit easier to incorporate into the landscape. Here is a shot taken about two years after planting. Today, after approximately eight years in my garden, this “shrub” is now about eight feet high, and partially screens a view of my neighbor’s house, to my pleasant surprise. Kanjiro has a somewhat upright, vase-shaped habit in the landscape. 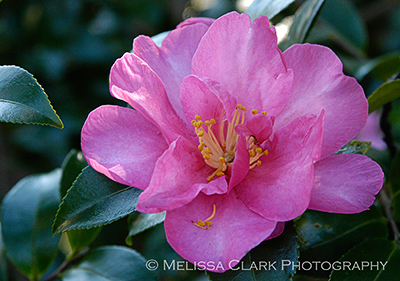 While the individual blooms of sasanqua camellias and the ‘Ackerman hybrids,’ as they are often called, aren’t like the lush, full blooms of a Camellia japonica (see the images in my Filoli Center and Gamble Garden posts from last February), they can be numerous and eye-catching. In my garden, ‘Kanjiro’ begins blooming on or around Thanksgiving and can continue until the end of January if we don’t get a hard freeze. Developed in large part by the work of Dr. William Ackerman, “winter-hardy” hybrid camellias can be grown in Zones 5b and warmer, especially if given some protection when choosing their site. Ackerman’s hybridization work has resulted in the creation of such varieties as Camellia ‘Winter’s Interlude’ and ‘Winter’s Snowman’ (among many others). Winter's Interlude, a cross between the tea camellia (C. oleifera Plain Jane) and C. sinensis Rosea, can be used as a hedge since it tends to spread both horizontally as well as vertically. Guess the gorgeous pink flowers are just an extra added bonus! A triple-cross with tea camellia, sasanqua and C. hiemalis parentage, Winter's Snowman has white, semi-double or anemone flowers from mid-November through December. Another good choice for hedging situations. 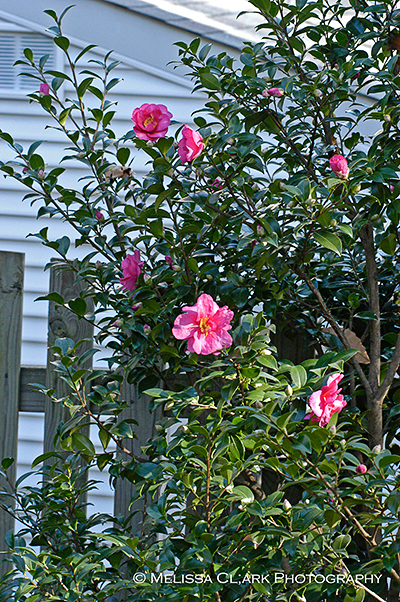 I’ve used a number of these fall/winter-blooming camellias in client gardens, either to provide winter interest or to help screen a utility meter. They may go in at a relatively small size but since they grow well in filtered sunlight, even in the shade of a building, in a couple of years they do the trick. One word of advice for those of you interested in adding them to your garden: Dr. Ackerman recommends planting them in the spring to give their roots the best chance to settle in before the end of the growing season. 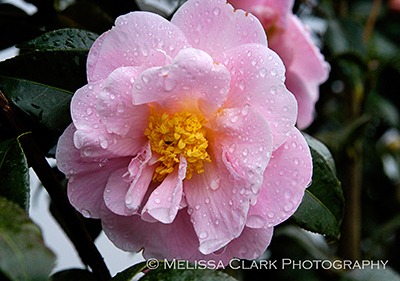 For more information on these camellias and the fascinating history of their creation, read Dr. Ackerman’s description of their origins and development here. In the meantime, keep your fingers crossed for me – I’ve just pushed the boundaries further by planting a Camellia japonica cultivar (‘April Blush’) in the front of my house, late in the season – with apologies to Dr. Ackerman and lots of prayers to Mother Nature!